This weeks Fitness Friday is more health related if you hadn’t already guessed. I don’t know about you but I always find that I can easily commit to being fit but struggle to keep my diet healthy all the time. Personally I try to change small things in my diet one at a time so I can make a habit of it. One of these things is drinking green tea! Since I started working in an office my tea consumption has gone through the roof, and although many say tea is a healthy alternative to drinking coffee, it still has plenty of caffeine in it when drank in large quantities! 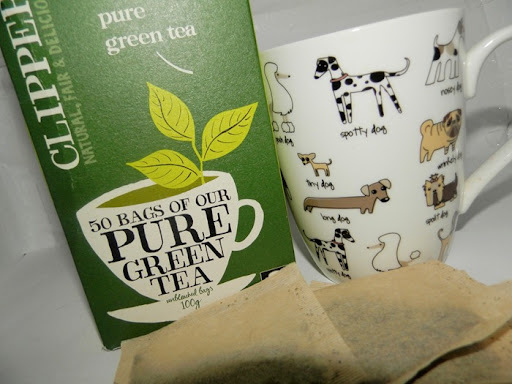 So as I have started swapping my builders brew for a green tea when I’m in the office I thought I would share the health benefits to drinking green tea, in the hope that some of you may swap one of your usual brews to a green tea! Its a healer- Green tea is packed full of goodies and antioxidants that can help fight against certain medical conditions such as;cancer, rheumatoid arthritis, high cholesterol levels, cardiovascular diseases, and infection. Smile- Green tea can help prevent tooth decay and bad breath. Its bacteria destroying abilities kills the bacteria that causes dental plaque. Weight loss- Green tea aids weight loss… fact! There have been countless studies across the world which have all found that participants who drank green tea lost more weight than those who did not. Green tea boosts that metabolism of yours, meaning you burn the fuel in your body quicker than before. Need a boost? Green tea enhances the energy levels in your body! so when you get to that afternoon slump, instead for reaching for a coffee and chocolate bar, try a green tea instead! Depression- Scientists have found that there are goodies in green tea that help fight depression. However like with all teas, those who drink it find that it is relaxing and helps fight against episodes of anxiety. Hydration! We all know the importance of drinking water, however I know many of you do not like the taste of it. 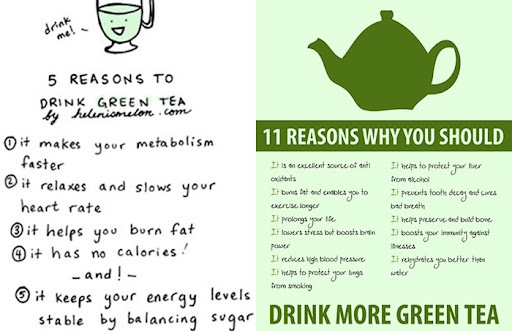 So how about drinking a few cups of green tea? Green tea provides hydration benefit similar to water… plus it has no calories or sugar unlike some flavoured water! Fight the Flu!- Green tea’s high levels of antioxidants along with its Vitamin C consent help fight against infections and keeps cold and flu at bay! Do you drink green tea already? Do you know of any other health benefits to share with everyone? Would you swap your usual brew after reading up on the benefits to green tea? Green tea issuch a staple for me! Hello Cat! What a wonderful post. I simply adore tea, I drink it quite often and I love experiencing all types of tea.I have to say that black tea is indeed my favorites, though I can't have it regularly as I am sensitive to caffeine. But I do enjoy green tea as well. My favorite is Longjing tea. Have you ever tried it? It's quite good! It's known as the Queen of Chinese teas.The health benefits are tremendous as you said! Green tea is also good to prevent type II diabetes as it balances insulin levels and lowers triglyceride levels. http://www.therighttea.com/green-tea-health-benefits.htmlMoreover, due to the presence of EGCG, it helps to protect brain cells and promotes neurorestoration, thus preventing neurodegenerative diseases, such as Alzheimer’s, Parkinson’s or multiple sclerosis.